We've been having a chilly weather for the last couple of days, which reminded me that it was time to fold some snowflakes. 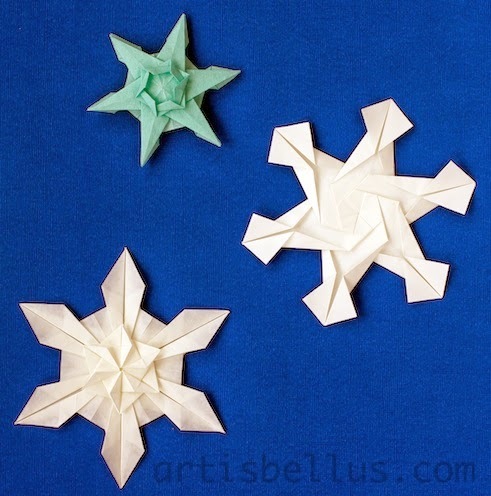 Origami snowflakes are great decorations for the Holiday Season. I always hang a few of them on my Christmas tree. All the snowflakes in the picture were designed by Tomoko Fuse. 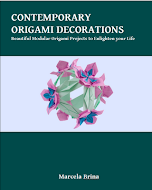 The instructions to fold the two ones on the left can be found in her book, Origami Stars and Snowflakes, ISBN 9784416309148. The instructions to fold the one on the right can be found in her book, 12 Months in a Small Box - Autumn Winter, ISBN 9784480873408. Light blue snowflake, on the left. 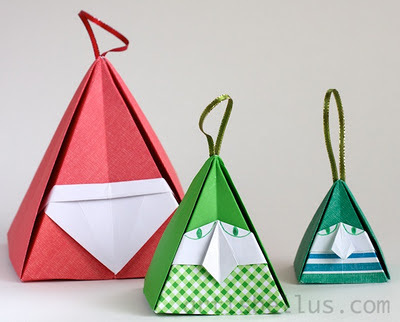 It's folded with an hexagon cut from a 6" (150 mm) square of thin washi paper. White snowflake, on the left. It's folded with an hexagon cut from a 9" (225 mm) square of Pacon Paper Squares . White snowflake, on the right. It's folded with six 3" (75 mm) squares of regular origami paper.